Editor’s note: The Friends of the Martinez Library Board has established a Legacy Fund to provide a permanent fund to support the newly renovated library and provide financial support of increased staff in the new downstairs area as well as the other enrichment programs the Friends have always provided. Two Board members have announced a $1000 Challenge Grant to match donations from members of the public. Donations may be sent to the Friends of the Martinez Library Legacy Fund, 740 Court Street, Martinez, CA 94553. The Friends of the Martinez Library newsletter arrived in my mailbox recently. In it was the announcement of a Legacy Fund to be established for future support of the newly renovated Library and all its enrichment programs. So I sat right down and wrote a check. I feel a great attachment to our local library. For one thing, the building was constructed in 1940 -- the year I was born. Funny but when I first entered it in 1962, I thought it was much older than I was. When I saw the line offering a chance to make the contribution a memorial, I thought immediately of two great Martinez ladies. Margaret Swett (Peg) Plummer worked at the library for 14 years after her husband died. Charlotte Reed McHarry was a lifelong resident and a constant library customer. I didn’t know either of them well but they were part of the fabric of Martinez life for the first 8 decades of the 20th century and somehow it seemed fitting that they should be remembered in the institution they both loved. As a new junior high social studies teacher I taught the way I had been taught so of course in the spring every student in my classes had to research and write a "Report" on some country or other. I probably drove the six blocks to the library instead of walking to it as I would now – but I was thin then. At the checkout desk which at the time was just to the right as you entered, a pleasant lady with glasses and white hair flashed a welcoming smile. It was the first time I met Peg Plummer---it was a considerable time later and not from her that I learned that John Swett was her grandfather. When I told her that I would be sending students down to do research, she thanked me for the advance notice. As a pretty regular patron for many years, I always enjoyed seeing Peg there and was very pleased when my increasing involvement in town life particularly through working on the News-Gazette during school vacation periods meant that I encountered her much more often. Charlotte Reed McHarry was an energetic lady who played sports when attending Alhambra Union High School and gave the impression when older of the kind of energy that had led her as a youngster to roller skate endlessly around the Courthouse (now the Finance Building) which featured a wide concrete sidewalk around the entire block unlike the wooden sidewalks in front of her father’s stationery and ice cream shop on Main Street. Charlotte’s link to the library was that of a voracious reader. One day a librarian told me a sweet story I have treasured ever since. As Charlotte aged, she, as did my mother, would pull a book off the shelf, read the précis pasted inside the back cover, decide it would be a good read and check it out only to discover at home that she had already read it. Charlotte was a practical problem solver who came up with a solution she thought she alone knew - she would lightly pencil a circle around page 108. So possibly even before she read the summary, she checked her ‘aide-de-memoire’. Turns out the librarians all knew Charlotte’s trick and were just fine with it, even possibly sympathetic. Interestingly enough, both women were among the eleven girls and five boys who made up the Alhambra Union High School Class of 1919. In a class history written for the Torch that year, it was noted that of the 32 students who graduated from Martinez Grammar School (now the Boys and Girls Club) all but six enrolled in the High School (then on Court Street where the school district maintenance yard and administration building are now located). Boys made up one third of the freshman class, about the same as when they graduated although there were ten fewer students in the 1919 class on graduation day. One of the boys who dropped out was Charlotte’s classmate and future husband, Arthur McHarry. The senior Robert Hilson who graduated around the same time told me years later that it was very common for there to be more girls in a graduating class in the early part of the century than boys who often dropped out to go to work. In fact, Arthur McHarry’s father was killed in an accident on the family ranch on McHarry Road in Franklin Canyon and he is not listed as returning for his junior year. Peg, who was class valedictorian, showed a gift for writing and poetry but apparently not for science and math. She left her "physics book to the highest bidder, praying that he may gain more knowledge from it than I ever could." Charlotte was athletic and a star member of the AUHS girls basketball team losing only to Richmond in six games. She also served two terms as student body secretary. Both graduates went to UC Berkeley with Peg’s parents moving there to provide housing for her, a not uncommon practice in those days. Peg became a teacher in a number of schools in Sonoma and Mendocino Counties where she married a rancher. 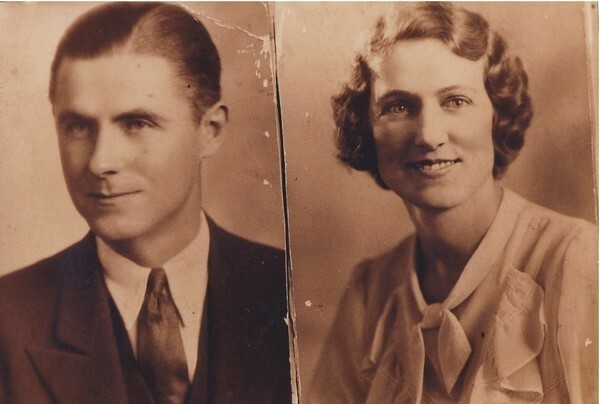 The couple and their son, John, returned to Martinez after World War II to help her father, Frank Swett, run the Alhambra Valley ranch established by her famous grandfather. Her son and his wife still live there. When her husband died, Peg went to work at the Martinez Library following that with a decade as a park ranger assistant at the John Muir National Historic Site where her childhood memories of John Muir and the life he and her grandfather led as farmers entranced visitors. Charlotte’s family came to Martinez in 1901 and started W. G. Reed, a stationary/news/book/candy/soft drink and ice cream store on the 700 block of Main Street, just a few doors east of the City Hall Apartments and the Novelty Theatre and across the street and to the west of the Bank of Martinez (now Union Bank). When Mr. Reed died in 1933, Charlotte and Arthur came home from their jobs in Oakland and took over ownership of the store which they sold in 1968 to local residents Mary Savioni Longsine and Sally Fontana Delevati. Mary, who later partnered with Pat Cardinalli, was very fond of the McHarrys and very grateful for the encouragement the couple gave her. Both women were remembered fondly at the time of their deaths in the late 1980’s. "Peg never talked about herself," fellow John Muir site ranger Pat Thomas recalled. "Everyone, young and old, was drawn to her. She always had a way with young people of focusing on them, on their interests. She always made you feel good about yourself." And although she willing shared memories of her famous grandfather, John Swett, and his equally famous friend, John Muir, she was always clear that she was a child at the time – 12 when John Muir died. "A child doesn’t make a chum of her grandparent’s friend," she said in her typical self-deprecating manner. Her head also wasn’t turned by appearing on the Today Show during the 150th anniversary celebration of John Muir’s birth in 1987. Charlotte was remembered by fellow AAUW member Ruth Newman this way: "the thing about Charlotte is that she was always upbeat. She was always so witty and full of fun!" Trina Harris who came to Martinez as a young bride just after World War II remembers how friendly and helpful Charlotte was to customers and willing to order anything they needed if the store didn’t have it on hand. Charlotte was more of a joiner than Peg who was secretary of the Alhambra Valley Improvement Association for many years. Charlotte on the other hand belonged to Soroptimist International, the Martinez Music Forum, the American Association of University Women, the Chamber of Commerce and Chapter Gamma XI of PEO. Both cared about the town, loved the library and believed in education. Their names definitely belong on a remembrance list of supporters of the Martinez Library and indeed the entire community. Charlotte Reed McHarry as co-owner with her husband, Arthur McHarry, of Reeds Stationers – the downtown Martinez business founded by her father in 1902. A bright, energetic, active Martinez resident, she was also a voracious reader and patron of the Martinez Library. Born in 1901 around the time her parents moved from Winters to Martinez, she died in 1987. 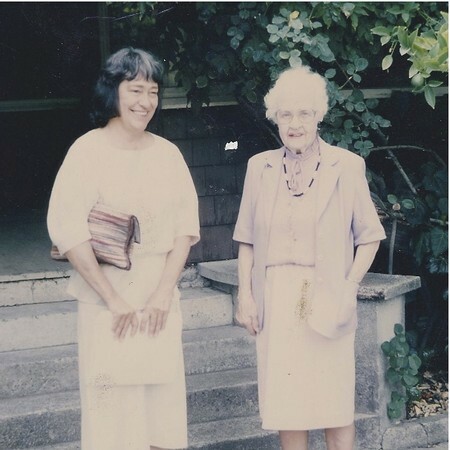 Margaret Swett "Peg" Plummer, right, is shown with longtime DVC history instructor Ruth Sutter in 1986 when Ms. Sutter was preparing the John Swett papers and memorablia for donation to the Bancroft Library at UC by his granddaughter, Peg. The picture was taken on the steps of the Swett home at Hill Girt Ranch on Alhambra Valley Road. Peg was a librarian at the Martinez Library for 14 years following the death of her husband and a ranger’s assistant and tour leader through the John Muir House for 10 years thrilling visitors with anecdotes of the famous explorer and environmentalist and life in Martinez around the turn of the century until just a few days before her death in 1988 at age 88.